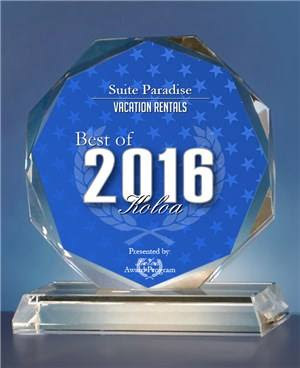 KOLOA December 8, 2016 -- Suite Paradise has been selected for the 2016 Best of Koloa Award in the Vacation Rentals category by the Koloa Award Program. Each year, the Koloa Award Program identifies companies that we believe have achieved exceptional marketing success in their local community and business category. These are local companies that enhance the positive image of small business through service to their customers and our community. These exceptional companies help make the Koloa area a great place to live, work and play. Suite Paradise is the best bunch of friendly, fun and down-to-earth, easy to get along with people of any rental agency I've ever used. Besides that, their level of service and cooperation has been unparalleled in my experience. It was like having our private home 'on-island' close to beach and activities. Wonderful access to beach, beautiful gardens, nicely equipped kitchen. Everything was wonderful, fantastic accommodations, nicely maintained grounds, incredible view, friendly staff, great location, reasonable price. The accommodations were outstanding. The condo was extremely spacious at the same price as a resort hotel room. We felt at home. Nothing needs improvement. We are very impressed and will be repeat customers. We thank you all for making our recent vacation on Kauai at Poipu Kai Resort the best we've ever. We researched a number of accommodation possibilities before deciding on Suite Paradise and are delighted with the quality of service we received. The condo was perfect and met all of our expectations. The gardens were beautiful and immaculately maintained which made it a very lovely place to be. The Guest Services staff made it extremely convenient to reserve activities and rent chairs and snorkeling equipment. We were amazed with the scenic beauty and varied outdoor recreation opportunities on Kauai – such a beautiful island. We will definitely be back, but next time we'll stay longer. Thank you again! Spent 25 days in Hawaii. We went to five islands. We liked Kauai the best and are planning to return. We experienced the most beauty and sense of peace on your island and at your resort. Beautiful landscaping, in-house laundry facilities and CD player, accessible parking, extensive kitchen supplies, comfortable bed and pillow. Unbelievable! I cannot tell you what a fabulous time we had during our stay. The accommodations were exceptional–the spaciousness, the views, the location–all were superb. We had never before been on a true family vacation, but we will definitely return to Kauai. Our children are teenagers–we spent the entire nine days together and had a blast. We have recommended Suite Paradise to all of our friends. This sprawling 70 acre resort (Poipu Kai Resort) sports lots of open ground, widely varied accommodations and close proximity to the Hyatt and its restaurants and shops. Although many rental agents represent Poipu Kai, Suite Paradise has the better rooms and at lower prices. If you book yourself, do it through Suite Paradise. With an ocean view, a large living room with a sofa bed for our 11 year-old son, Rory, a well stocked kitchen, guidebooks, washer-dryer, a television and the run of the resort's tennis courts and swimming pools, as well as the beach concession for cheap rentals of body boards. There was even a championship golf course over the hill. Who could ask for more? My dream day on Kauai really did occur when we stayed at a Suite Paradise location...I loved the complex, the condo provided by Suite Paradise, the bottle of wine left in the fridge by Suite Paradise, the view of the ocean, the peace and serenity of the location...We didn't want to leave! Please don't change a thing! ...nice, very spacious and fully equipped. My family and I greatly appreciated the stay with you. Everything was also so well taken care of, from check-in arrangements to the beautiful grounds and convenient walking paths. Suite Paradise has built this reputation because of our wonderful staff!